Construction is in full swing on the brand new 14 floor South Glasgow hospital. The total cost of the new build hospital is in the region of £842 million, and is set to open its doors in Spring/Summer 2015. 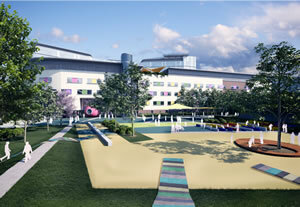 The new hospital has a total of 1109 beds in single room accommodation with en-suite facilities. There are also 240 beds in the children’s hospital which is operated with separate functions and accessed via different entrances to the main hospital. 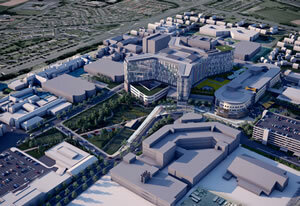 It will be one of the largest hospitals in the UK, containing 30 modern operating theatres, and a separate laboratory block providing biochemistry (study of chemical process in living organisms), haematology (study of blood) and blood transfusion. The special feature of the new hospital is the single room accommodation, which is designed to address the issues of hospital acquired infection (HAI), along with other diseases and germs that can easily spread in open-plan wards. Each ward will have a large window facing onto the main corridor, to allow for clear vision between the staff and patients. The bedrooms will be light and airy, offering some great views to the outside world. The new ward layout with special ‘touch-down’ stations have been arranged to help the staff deliver an even better level of care. 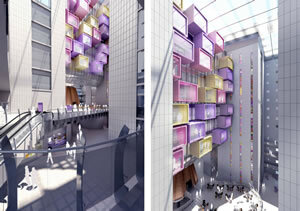 The design will also provide socialising points where the patients can meet. 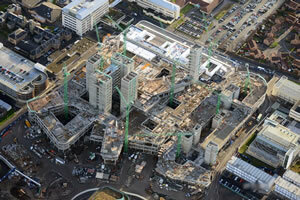 Armorgard have been providing several products to this large construction site in Glasgow through various distributors. The very popular product has been the PipeRack, which is a mobile unit designed to store and transport long lengths of copper pipe and conduit. The PipeRack is a very efficient way of manoeuvring lengths, as it prevents the need for any ‘re-stacking’ of resources as your job moves on through the site. A linking kit is also available, which enables you to join two PipeRack’s together and cater for 6 metre lengths! This is the only certified PipeRack on the UK market and comes supplied with a certificate of conformity. The world is growing taller as the iconic 1km high Kingdom Tower project, in Jeddah, Saudi Arabia takes shape. The Kingdom Tower will stand at 3280ft (1km) high, which is around 3½ times the.